Not registered at GTAForums.com? Registering is fast, free and easy and allows you to instantly reply to any topic on the boards. Why wait? Click here to register your own unique username and become part of the ever-growing community! 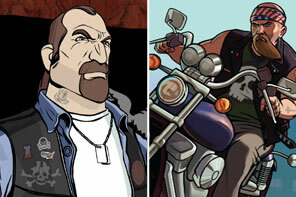 Main Character Poll - Who do you think will be the main character in Vice City Stories? The facts will soon be revealed by Rockstar, so make sure you vote now to see if you were correct. Mitch Baker appears to be favourite at the moment..
VCS Boxart - by Asif. What are your thoughts on the recently revealed boxart? Post them here. 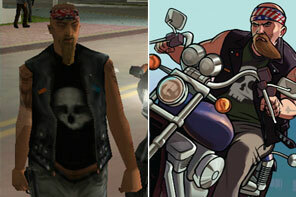 GTA:VCS Wishlists - What would you like to see in Vice City Stories - Planes? Ability to swim? Skateboards..? Post your ideas in this thread. Wallpapers for PSP & PC - Vice City Stories wallpaper for PSP and PC, made by the members of GTAForums. Feel free to submit your own, or use ones created by other members. You can also discuss Vice City Stories live at irc.gtanet.com. Grab an IRC client (such as mIRC) or use the java applet over at GTANet.com. I think this was fairly obvious anyway, but it's always nice to have confirmation. Jordan from our partnersite PlanetGTA, was able to get in touch with Young Maylay (who voiced Carl in GTA San Andreas) and confirm that he will not be playing any part in GTA: Vice City Stories. So when will we learn about the plot/setting/character (etc) details of Vice City Stories? This week, I fired off a few emails to find out who will be previewing it, and most importantly when. First I got in touch with PSM2, who claim they've already seen the game (just a few days ago) and that they'll have "shots and details" in an issue which is due to be on sale 31st August. I also spoke with the editor of GamesMaster, and they too have a preview planned, though they're not sure what's going to be in it yet because they've yet to speak with Rockstar. This issue is on sale 1st September. Both are UK magazines, so if you're living in the UK then be sure to pick up a copy of each on the dates listed above, where all will be revealed about GTA:VCS. Stay tuned for more updates. flore (from our forums) has done a good job of extracting/tidying up the artwork contained in the official boxart which was released yesterday. Check it out..
After further inspection, I noticed the two characters at the bottom bare a close resemblance to Colonel Cortez and his right hand man Gonzales. 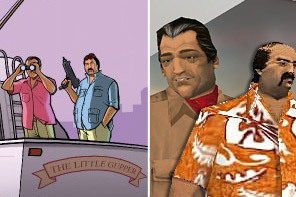 In GTA Vice City, Cortez was forced to leave the city after running into problems with the French, and his no.2 Gonzales was killed during the mission "Treacherous Swine". This means that - if these two characters are definitely who I think they are - then Vice City Stories is set prior to GTA Vice City (late 70s, early 80s perhaps?). 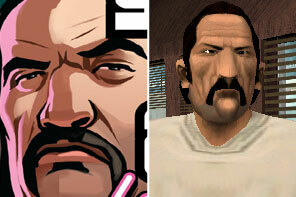 Also the fact that Gonzales has a full head of hair in the boxart (whereas in GTA Vice City, he doesn't) supports this theory. Mrs. Shrub is the wife of congressman Alex Shrub (who featured in the mission "Martha's Mug Shot" in GTA Vice City) and as you can see in the comparison picture above, the hair style and body build etc. 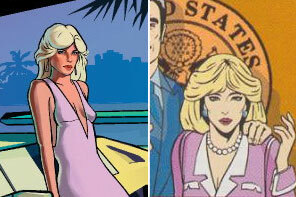 is exactly the same, so Mrs. Shrub will - without a doubt - make an appearance in Vice City Stories. 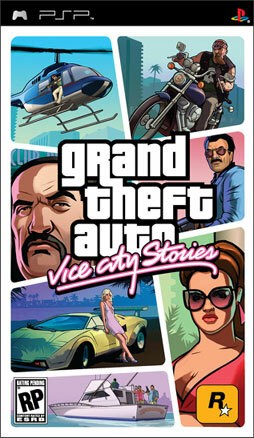 R* have just released the boxart for Vice City Stories, see below.